It’s all in the stars, but it’s also all in our stores. Today on Market Street’s blog we are your resident astrologers- Check out our charts, find your sign and read more why these fashion pieces fit your horoscope. Let’s shop to the moon and back! Aries have a thing for energy- like, having way too much of it. Catching them in Lululemon workout clothes is like catching a mosquito on a hot summer day in Houston- totally unsurprising. Taurus know just how to slow down and appreciate the best things in life. They especially like to keep it homey and cozy. A need easily met with one of Southern Marsh’s to-die-for comfortable pullovers. Gemini is the sign of the twins, and what makes a better pair than Kendra Scott earrings? The perfect accessories for anyone looking for variety and sparkles! Cancers are like the mom of the zodiac- they always seem to be taking care of everyone else. And what screams ‘I got my life together’ more than some J. McLaughlin? It’s hard to not notice a Leo when they walk in the room- whether it’s their lion’s mane of hair, dazzling personality, or brightly colored Kate Spade purse, they will always be the center of attention. You’d never catch a Virgo with a single hair out of place, and especially not on their smart J. Crew blazer. 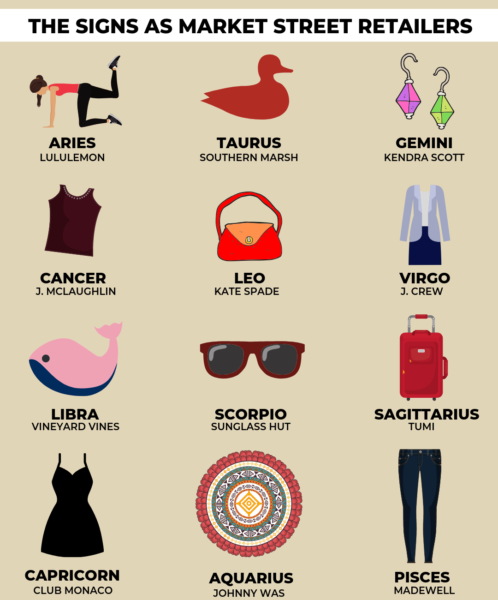 Libra’s are the stylish socialites of the zodiac, and just the type to love that iconic pink whale of Vineyard Vines. Scorpio’s are known to throw some shade now and then… get them to the Sunglass Hut, stat! Sagittarius are known for their wanderlust. They’ll need some world-class luggage from Tumi for all their travels – duh! Capricorns like to play hard and work even harder and will need the perfect outfit to keep up with them. Club Monaco’s little black dress is prime for keeping up with their crazy schedules. From CEO to GNO. Aquarius are eccentric, energetic & independent. Johnny Was’ hippie inspired designs embody their spirit- they’re ready for their next adventure and spontaneously boarding the plane now with or without you! Pisces are artistic, generous, friendly and just full of goodness. Which is totally up Madewell’s alley with their Blue Jeans Go Green project that takes old denim and turns it into housing insulation.